Cabinets are classified into categories such as tall cabinets (sometimes called pantry cabinets), wall cabinets and base cabinets. As you look at different cabinetry solutions, you may wonder what the difference is between one cabinet and another. 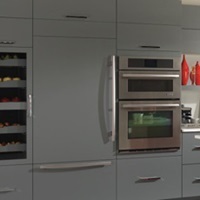 In this overview, you’ll learn about the types of tall cabinets available and how you can use them. Tall cabinets top many other cabinet types in terms of both height and storage capacity, making them the true "high achievers" of cabinetry. 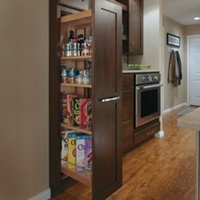 They are available in sizes up to 96 inches in height.Tall cabinets are often used for pantry and utility storage, with the ability to accommodate large or unwieldy items, from bulk food supplies, to mops and brooms, to kids' jackets and boots. 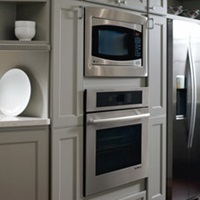 Oven cabinets are available in different configurations and various sizes to accommodate single or double ovens, as well as oven-microwave combinations (like this Oven and Microwave Cabinet) and warming drawers. 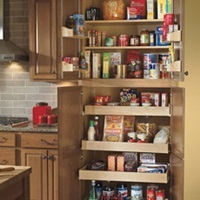 The Pantry SuperCabinet is the ultimate in pantry organization and storage, keeping must-have items easily accessible. Tall Pantry Pullout Cabinets keep cooking essentials at your fingertips, thanks to narrow shelves with racks on each side. Utility tall cabinets vary in design, but can include shelves, hooks or even drawers to hold smaller items in a kitchen, bath, laundry or mudroom. Some specific types available include the Utility Drop Zone Cabinet (shown), Utility Organizer Cabinet, and Utility Easy Access Cabinet.